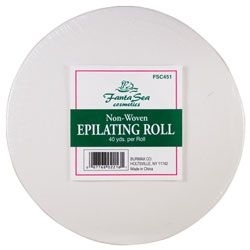 This non-woven epilating roll is made of a non-woven muslin material. Great for use with all soft waxes! It is highly economical, as it can be cut to customized lengths and shapes to fit just about any waxing need. This roll has a reputation for being a favorite among estheticians! The roll has a width of 3 ¼" and a length of 100 yards.